LEGO was the start of many people’s maker hobbies, because the simple building blocks appeal to everyone’s innate sense of creativity. LEGO bricks have been in production for 70 years now, which means several generations of children have grown up with them. There doesn’t seem to be any sign of that stopping anytime soon, and kids today still enjoy LEGO just like you did. Grant Gibson decided to take advantage of that and build a drink dispenser with his son out of LEGO and a Raspberry Pi. You may remember Gibson from his Sjoelen game that he built with the help of a Raspberry Pi. Over the past couple of weeks, Gibson’s son has been home from school for the spring holidays. That means that Gibson had to find a way to keep his son entertained, and ideally in a way that is also healthy, educational, and productive. The project he decided to get his son working on was an automatic Alexa-controlled drinks dispenser, and LEGO bricks were the perfect material for constructing the frame of the machine. The project started with Gibson’s son building the frame from standard LEGO bricks. That houses the bottle that contains the drink to be dispensed, the Raspberry Pi, a small water pump, a relay board to turn it on, and place for the cup to go. The water pump is powered directly from the Raspberry Pi’s 5V line, which isn’t normally a good idea because the impedance can cause damage. But Gibson reports that it has worked fine so far. They then used the Flask-Ask Alexa Skills Kit for Python to control the relay through the GPIO pins with voice commands. It’s a simple project, but a fun one for Gibson’s son. 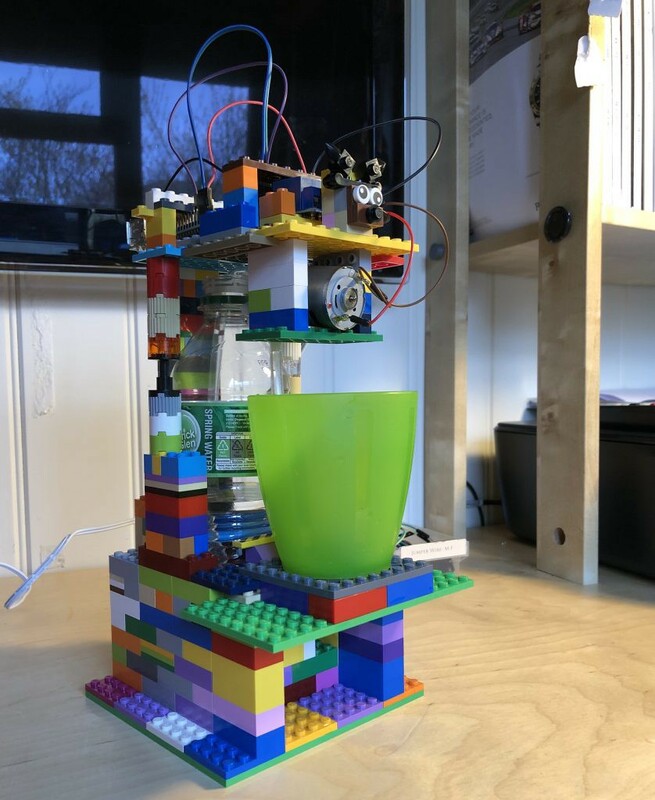 Voice-Controlled Drink Dispenser Built with LEGO and a Raspberry Pi was originally published in Hackster Blog on Medium, where people are continuing the conversation by highlighting and responding to this story.